This press statement has been updated to reflect that there are now nearly 250,000 signatures on petitions calling on big tech companies to drop their contracts with ICE and Border Patrol. 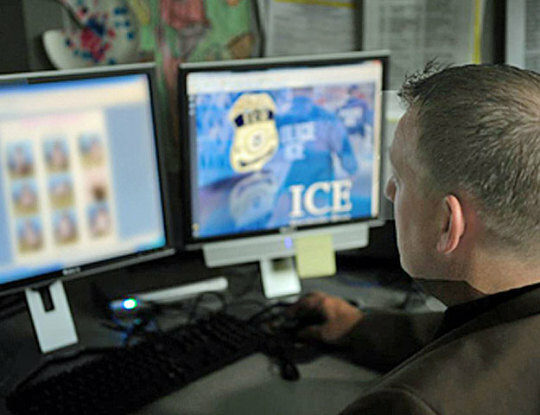 A growing coalition of grassroots advocacy groups are demanding that Microsoft, Salesforce, and other large tech companies drop their contracts with immigration enforcement agencies like ICE and Border Patrol. Amid disturbing reports of widespread human rights abuses, nearly 250,000 people have already signed on to petitions launched by Center for Media Justice, Color of Change, CREDO, Demand Progress, Defending Rights and Dissent, Fight for the Future, Free Press, The Nation, Presente.org, SumOfUs. The groups’ demands echo those led by employees at Microsoft, Salesforce, and Amazon whom have signed on to open letters saying that they do not want to be part of building software used to target immigrant families. The organizations plan to escalate their efforts in the coming days, including in-person protests and a petition delivery. See links to the separate petitions below. “The trauma of family separation will run deep for the children and families involved and big tech companies play a huge part in that. Technology can be used to protect or violate human rights. Companies like Microsoft and Salesforce have chosen to use their services to violate them all while saying they care about human rights. It’s hypocrisy. That’s why we won’t back down until all tech companies drop their contracts with ICE,” said Jelani Drew, Kairos Fellow at Fight for the Future, who launched this petition. “Microsoft must honor the demands of its own employees and thousands of people across the country calling on the company to drop its contract with ICE. Otherwise, it will forever be remembered as the tech company that powered Trump’s brutal policy of family separation and detention. The Trump Administration’s attack on children and families is unconscionable and Microsoft’s failure to act in the face of these glaring human rights abuses is beyond disturbing. History is calling, and it’s asking Microsoft to take a side,“ said Reem Suleiman, senior campaigner at SumOfUs, who launched this petition. “Microsoft is approaching a day of reckoning. They’ve gained millions while hundreds of families have lost their children. The company must now make a choice - either help ICE continue to destroy families, or take action and cancel their contract. In the face of such inhumanity there is no other way,” said Steven Renderos, Organizing Director at Center for Media Justice, who launched this petition. “Corporations supporting the inhumane policies of the Trump Administration have lost their moral compass and will be held responsible for the violence and suffering they profit from. No company should be in the business of caging families. On this 4th of July, Presente members have declared their Independence from criminal or cowardly corporations who assist the President’s immigration racket.” Said Matt Nelson, Executive Director, Presente.org (he/him) who launched this petition. “If Microsoft is as shocked and dismayed as they claim to be by ICE agents forcibly separating children from their parents at the border, then they have a moral obligation to take action and divest themselves from the ‘mission critical’ services they provide to ICE,” said Reuben Hayslett from Demand Progress, he launched this petition. “We’re seeing that employees inside tech companies are pushing for the products they build to be used in ethical ways for people at the border and around the world. Microsoft employees are not accepting executives’ efforts to downplay the company’s contracts with ICE and are demanding that their work not contribute to the operations of this agency,” said Yana Calou from Coworker.org, which provides education for employees raising their voices at work. “Corporate complicity in human rights abuses can’t be excused, it must be exposed and stopped. Our members are eager to hold tech companies accountable for profiting off contracts with ICE, and to call out the hypocrisy of companies that decry family separation while helping the Trump administration enforce draconian and inhumane immigration policies,” said Sue Udry, Executive Director of Defending Rights and Dissent, who launched this petition. Several other organizations have already begun preparing their own campaigns echoing these calls.